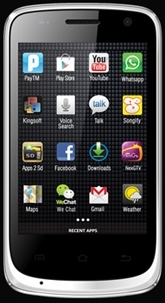 The Karbonn A1 Star runs Android 4.0 Ice Cream Sandwich and is a dual SIM device. It features a 3.5-inch HVGA display with a resolution of 320x480 pixels. The smarphone is powered by a 1GHz processor with 256MB RAM and 3 megapixel rear camera and a VGA front-facing camera. The internal storage which is 512MB can be expanded up to 32GB through microSD card.